This article is a step by step breakdown on rates and the different settings that you can do. The system will require at least the daily rates for it to work properly. There are two ways to add it, one by one using the add rate function or by the bulk using the fill missing function. When you are adding in the rates into the system, you will have to enter the rates without the tax as the system will add the tax on top of the rates. This page is located under the Car Rental category in the settings, highlighted in dark blue in this picture below. This is the light blue button “Fill Missing” located on the top right of the page, highlighted in orange in the picture below. This method will add the rates by bulk but does not have the decreasing rate structure for you to set if any. You would still have to go to the rates manually to add that. Once you click this button, a new window will open. This window contains all the rates that you would need to fill in for the particular season and vehicle class. Do note that the system will require the Daily Rate to work. Click on the blue “Save” button, highlighted in orange in the picture below, to save the changes once you are done. This is the blue button “Add Rate” located on the top right of the page, highlighted in orange in the picture below. This method will add the rates one by one. Once you click this button, a new page will open. This page contains all the rates and the settings that you would need to fill in for the particular season and vehicle class. Do note that the system will require the minimum of the Daily Rate to work. Each rate you enter in the system should be without tax percentage (if any) as the system will add the tax on top of the rate. For a better understanding of how the system calculates the rates, you can refer to the blue boxed “Rate Logic” located on the right of the page, highlighted in orange in the picture below. You can also delete a rate that you no longer use by clicking the particular rate and clicking the red “Delete” button, located on the top right of the page, highlighted in orange in the picture below. 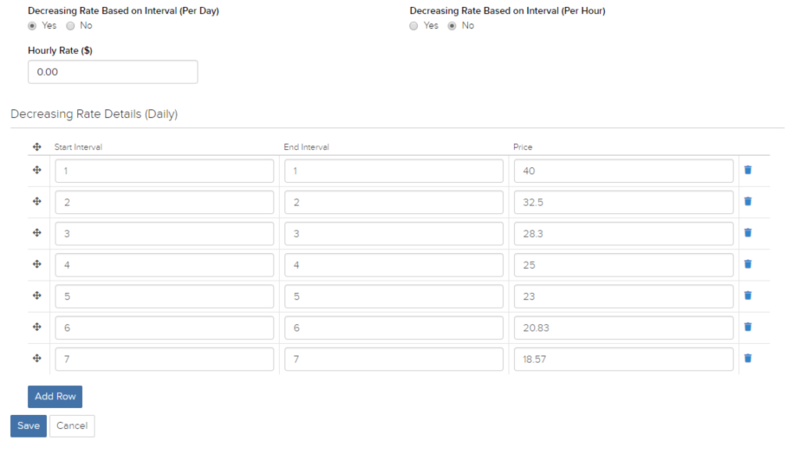 When you click yes on either decreasing rate based on interval (per day) or decreasing rate based on interval (per hour), a new section will appear as shown in the picture below. You can add a new row for intervals by clicking on the blue “Add Row” button. To delete a row, click on the blue “trash bin” button on the right of the row that you would like to delete. How does the decreasing rate structure work? For example of how the structure works, in the picture above, you will be giving a total price of $100 for 4 days, rather than the $160 for 4 days. The formula to count the price is the total price ÷ number of days. The system takes up to 2 decimal places by default. You can change this in the settings by navigating to Settings > Car Rental > Advanced tab > Quantity of decimals to use in Rates. To set up recalculate rates on an early return or recalculate rates on late pickup, navigate to Settings > Car Rental > Rates & Day Calculation section. 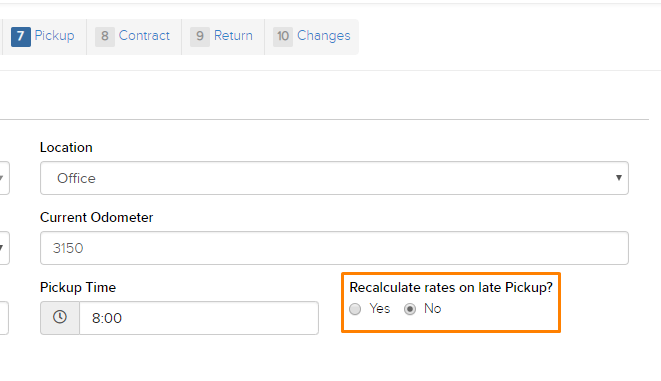 If you would like to enable either, set “Recalculate Rates on Early Return or Late Pick” to “Yes” as shown in the picture below highlighted in orange. By doing this, it will always recalculate the rates when it is early return or late pickup. If you would like to only do it per reservation basis, you can set the option to “Yes” in either Step 7 or Step 9. An example of in Step 7 is shown in the picture below. It is important to note that if the customer does an early pickup or late return, the system will automatically recalculate the charges. Therefore, make sure that the correct date and time is in the system before heading to the next step or closing the reservation.